Mrs. Suon Sovanney started her career as a teacher in Phnom Penh. In 2000, she worked for 4 years as a trainer at Youth Resource Development Program and was promoted to be a training coordinator for another 7 years. Then working with the Working Group for Active Non-Violence, Sovanney led students to facilitate non-violence actors in Phe and Plorng Villages of Kampong Chhnang province and other places where there are disputes surrounding fishing lot and forestry. Sovanney has experience in the field of training for more than 20 years, especially training on social accountability, good governance, and critical thinking. 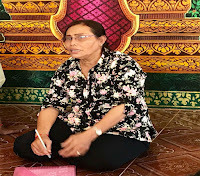 In CCSP, Sovanney is the Project Coordinator where she works to promote good governance and democratic development through ensuring high and effective capability of the commune and district councilors.